Juniper is a slow-growing, long-lived evergreen shrub or a small columnar tree. It generally has multiple stems that are spreading or upright. Juniper has a thin brown fibrous bark that peels in thin strips. Twigs are yellowish or green when young, turn brown and harden with age. The leaves are simple, stiff, and arranged in whorls of three with pungent odor. Young leaves tend to be more needle-like, whereas mature leaves are scale-like. The fruits are rounded, berry-like seed cones on short stems that are red at first, ripening to a bluish black. Juniper berries take two or three years to ripen, so that blue and green berries occur on the same plant. Each cone has two or three seeds. Type and Class of Livestock: Goats. Grazing Objective: Remove biomass, young plants, and young stems. Growth Stage for Treatment: Goats prefer seedlings or juvenile juniper plants or young regrowth from cut stems. Potential Effectiveness: Goats will eat younger parts of the plant before consuming older juniper. Goats can graze year round and can be very effective in controlling juniper. Essential oils, or monoterpenes, that give the plant its distinct odor can deter animals from browsing. Studies have shown that goat breeds differ in their ability to tolerate the chemicals in juniper; Boer-Spanish goats are better than Angora goats. Offering a high energy/protein supplement may enhance goats’ acceptance of juniper. Brock, J.H., 1988. Livestock: Biological control in brush/weed management programs. Rangelands 10:32-34. Fueilendorf, S.D., F.E. Smeins, and C.A. Taylor. 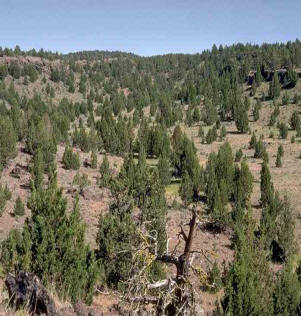 Browsing and tree size influences on Ashe juniper understory. Journal of Range Management 50:507-512. Hanselka, C.W. and J.C. Paschal. 1992. Brush utilization on the Rio Grande Plains. Rangelands. 14:169-171. Lyons, R.K., M.K. Owens, and R.V. Machen. 1998. Juniper biology and management. Texas A&M Experiment Station. Bulletin B-6074 9-98. Pritz, R.K., K.L. Launchbaugh, and C.A. Taylor, Jr. 1997. Effects of breed and dietary experience on juniper consumption by goats. Journal of Range Management 50:600-606. Taylor, C.A., Jr. 2002. Using goats to control juniper. Journal of Animal Science. Vol. 80, Supp. 1 Journal of Dairy Science Volume 85 Supp.1 Available at: http://www.asas.org/jas/2002abs/jnabs80.pdf. Accessed 12 July 2006.